Brad Schmett, of Brad Schmett Real Estate Group, and Keller Williams Realty announced today that Brad Schmett Real Estate Group is once again ranked #1 in the Greater Palm Springs Area. With over 200 homes sold in 2017, this is another record-breaking year for the team. We work tirelessly to stay up-to-date on every real estate trend and continue to be the experts in the greater Palm Springs area. 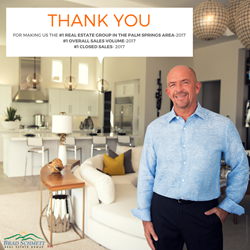 Brad Schmett, of Brad Schmett Real Estate Group, and Keller Williams Realty announced today that the Palm Springs area-based real estate team, which has long been one of Keller Williams Realty’s top-producing sales teams in North America, was named the greater Palm Springs area’s #1 Real Estate Group for homes sold in 2017. With over 200 closed sales, this is another record-breaking year for the team. Additionally, REAL Trends, the nation’s leading source of real estate news, trends and rankings, – widely considered the “Holy Grail” for the residential real estate industry – has also named the Brad Schmett Real Estate Group as the “Best of the Best” of California real estate teams. Schmett’s team specializes in non-gated residential neighborhoods, gated residential developments, golf course properties, resort properties, second homes, luxury homes and estates in the Palm Springs area. Schmett spoke recently about the unbelievable success of his team, “With over 200 sales, my team had another record-breaking year. Surpassing last year’s sales was no easy feat and it took extreme dedication and focus to achieve this goal. I couldn’t be prouder of my team. Every day we strive to execute world-class client service. We work tirelessly to stay up-to-date on every real estate trend and continue to be the experts in the greater Palm Springs area. We are deeply grateful for the recognition.” Schmett expects 2018 to be a banner year for the already wildly successful team. Find out more about investing in Palm Springs and Desert Cities real estate.